This entry was posted in Uncategorized and tagged auto, automobile, Bangkok, car, expectations, Hummer, Pink by christao408. Bookmark the permalink. I feel bad for whoever has to pay the gas on that tank of a car. 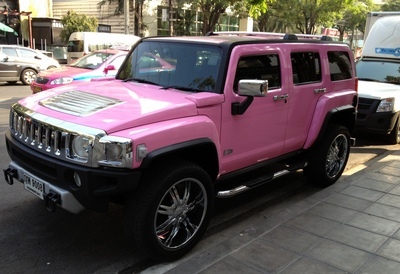 I will take it put not in pink – well depends on the miles per gallon too. There is a cosmetic company that gives their high sales volumn reps cadillacs painted in pink. Of course the majority of the sales force are women. when my car was in the shop the fellow said it’s next to the “banana” he was talking about a yellow hummer that my car was parked next to. ive seen that pink truck here as well. i have to admit though, that colour looks better on that particular model than any of the other cars I’ve seen it on. I don’t know how that thing can dart in and out of traffic. Bubble-gum pink truck: something to keep that trip on the road interesting. =)I wonder if the driver is a teenager or not, though. Then it would make even more sense for having it painted in that colour. My grandson says it looks like a tonka toy. I would be taking a second and third look at this out of place auto also. That’ll sure make a scene, especially when stuck amongst those colourful taxi cabs in the traffic streets! I wonder who’s driving this hummer?